Need a festive, inviting make-ahead brunch for the holidays? 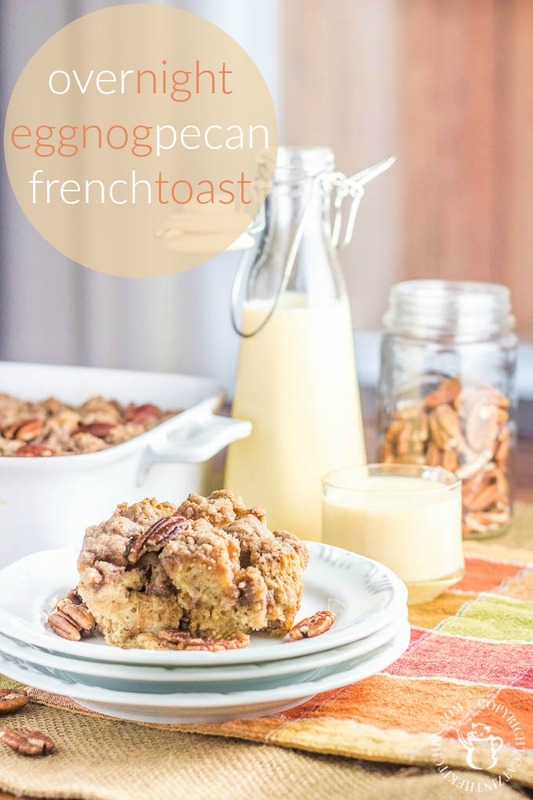 Try this delectable baked Overnight Egg Nog Baked French Toast recipe! This post originally appeared on the blog in November of 2013. We’ve changed up the recipe a little bit and updated the photos, but it’s still just as yummy as ever, and the perfect brunch for any post-Thanksgiving company you may be entertaining over the weekend! 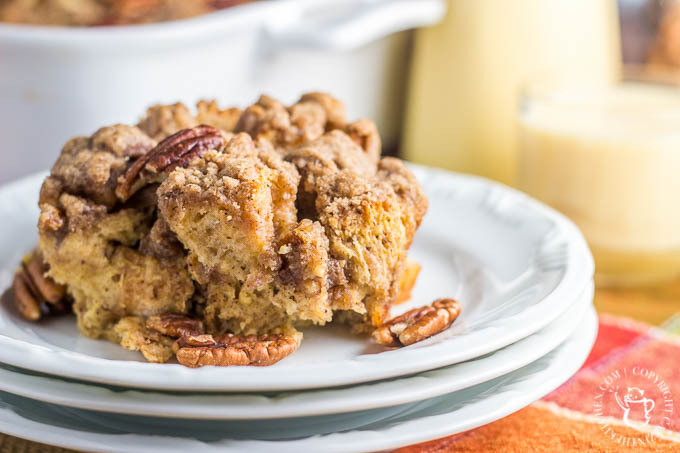 Actually, what’s remarkable about this particular overnight eggnog pecan French toast recipe is that it’s Chels’s invention, created almost immediately after complaining that we were eating too much French Toast. Seriously, I could eat variations on my favorite national toast each and every Saturday morning (or early afternoon), but Chels does get tired of it when we make too many recipes too close together. And, frankly, that happens during the holiday season, what with Cinnamon Apple Spice French Toast, Egg Nog French Toast, and Pumpkin Pie French Toast all begging to be made during the late fall and early winter months. At any rate, what inspired her to create a new French Toast recipe in the midst of French Toast burnout is beyond me, but here it is, and it’s fantastic. And I am anything but burnt out (insert “MOAR FRENCH TOAST” meme here). We’ve brought you baked French Toasts in the past. They aren’t complicated, but it is important to have the right bread and not to rush them. In this particular case, we decided to use whole wheat French bread from our local supermarket bakery (because it was on sale), which meant adjusting the recipe to accommodate the tendencies of whole wheat French – namely, it is normally drier and coarser, but holds its shape and body better (than white French). In theory, it’s also healthier, so that’s the recipe we’ll present you with here, but if white French is what you have, it’s probably a good idea to cut your egg nog down just a bit – perhaps by a half cup – to avoid mushy French bread. And, again, don’t rush baked French Toast. It’s wonderful, but it needs a night in the fridge to really soak in the moisture. If you wake up in the morning and really need your French Toast fix, make one of the other, faster, more on-the-spot recipes mentioned above – make this one when you have the time. Of course, this isn’t time in the traditional recipe sense. It won’t take long to make this at all – and in the morning, you’ll have a meal that’s basically ready to pop in the oven, which is especially nice on holiday mornings when you’ve got a lot going but still want to be able to serve a warm, indulgent, festive offering to your family and guests. A final note – we baked this in a glass 9 x 13 baking dish, but you could (and possibly should) use ramekins if you have enough of them available in a large enough size (we didn’t). Though it bakes up very nicely in the baking dish, we suspect that it would rise even more and be even a bit fluffier baked in a three inch (or so) ramekin. If you try it, let us know! Slice bread into cubes and place in a 9 x 13 baking dish. In a medium bowl, beat together eggnog, eggs, brown sugar, cinnamon, nutmeg, and rum extract. Pour egg nog mixture over cubed bread, tossing the bread to ensure even coating. 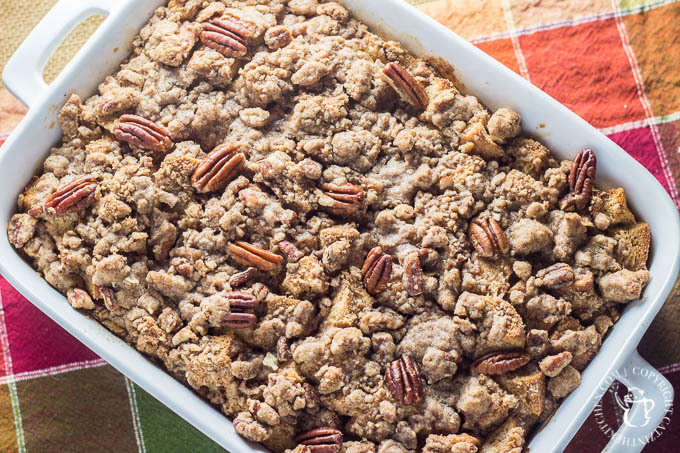 Spoon the streusel (recipe below) over the top of the French Toast and bake for 35-40 min. Combine all streusel ingredients, except the butter and the chopped pecans, in a medium bowl. Mix well with a whisk. 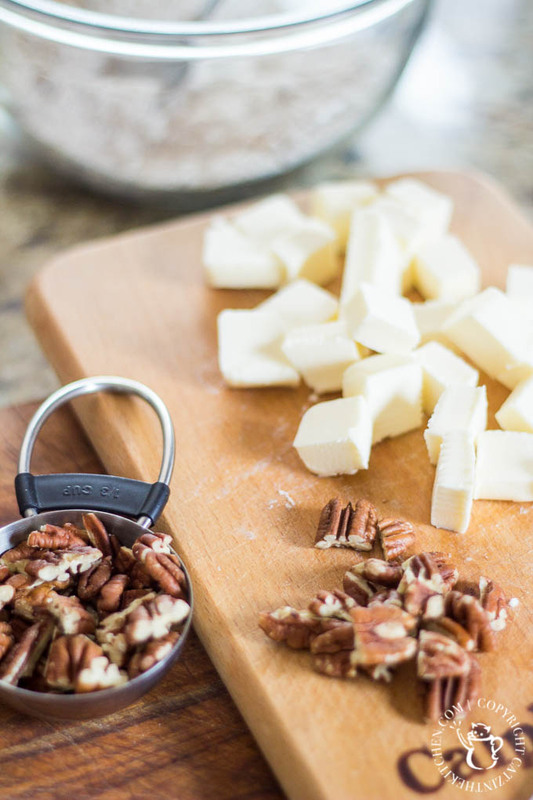 Using a pastry blender, cut in the butter until the mixture resembles, coarse or wet sand, and stir in the chopped pecans. Yum!!!! I just love french toast bakes so much!!! Eggnog is the perfect one for this time of year!!! Love this! I love eggnog flavored anything - especially breakfast! Yes!!! Eggnog is the best in breakfast! I'm so sorry that your other recipe you tried out wasn't that great. :( This one is really yummy though! Thanks for the comment and the following :) I Hope you have a wonderful weekend!